Shipping is $25.00 with insurance. Please allow 4 weeks for delivery on this item. "Gingerbread Cottage is based on a real 19th Century house I discovered in Southern England. The whimsical structure with its brick, stone, wood filigree, shingle siding, awnings, dormers, and spires, revels in a spirit of romantic excess. Here is the fairy tale charm of Hansel and Gretel's Gingerbread Cottage brought to life. "The front garden is a riot of rainbow colors with lavish flowers dancing in the evening breeze. I've provided a whimsical bench from which you may enjoy the advance of evening at Gingerbread Cottage." 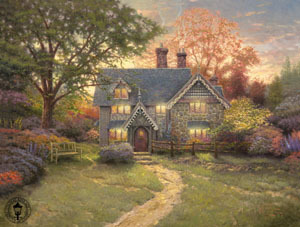 Gingerbread Cottage copyright© 2007 by Thomas Kinkade is prohibited from being copied. Thomas Kinkade art, gingerbread cottage, nostalgic street paintings, city scene, artwork, art work, canvases, images, paintings, pictures, and prints of Gingerbread Cottage by artist Thomas Kincaid for sale. Gingerbread Cottage painting by artist Thomas Kinkade can be purchased in art print or canvas form at special sale prices at Christ-Centered Art.